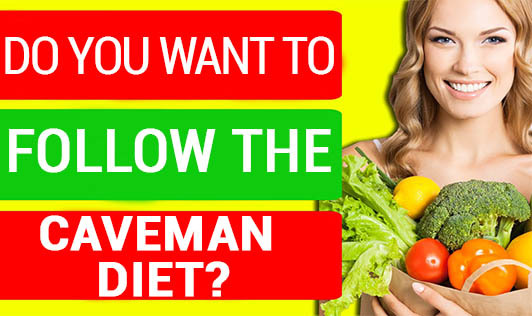 Do You Want to Follow the Caveman diet? The Caveman Diet, also called the Paleo diet, is a diet plan based on eating plants and wild animals like what the cavemen were presumed to have eaten around 10,000 years ago. Even though a true Paleolithic diet is impossible to mimic with the present generation foods, one can eat a modified version of the diet that includes lean meat, fish, poultry, eggs, vegetables, fruits and nuts. This diet shuns the consumption of dairy, grains, sugar, legumes, potatoes, processed oils, and foods that were grown after agriculture started. On this diet, one would skip salt and all other drinks other than water, coconut water, or organic green tea. And, if you have a sweet tooth, you can satisfy it with honey in restricted amounts. Since the diet comprises of lean protein, plant foods that contain fiber, and water as a source of fluid, this combination works together to control blood sugar, prevent weight gain, heart ailments and Type 2 Diabetes. The plan encourages people to be physically active on a regular basis. Earlier, hunter-gathers had active daily lives seeking food, water, and shelter, there by burning 1/3rd of their calorie intake. As per the American Dietetic Association, physicians, nutritionists and other health professionals debate on the practicality of this diet. Though this diet may be practiced by a few, the limitations are that people cannot sustain this diet for a number of reasons due to lack of variety, cost factor and potential nutrient inadequacies like calcium and vitamins due to the elimination of certain food groups. Moreover, daily consumption of red meat leads to high saturated fat intake that could have detrimental health effects and increase the incidence of cardio vascular diseases. It might seem primitive, but living a caveman lifestyle requires a great deal of will power to keep the current influences of modern lifestyle and changing environmental factors away!